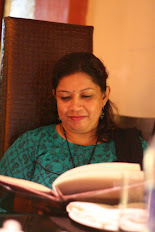 in North Indian recipes, Paneer, Punjabi cuisine, Side dish, Veg. 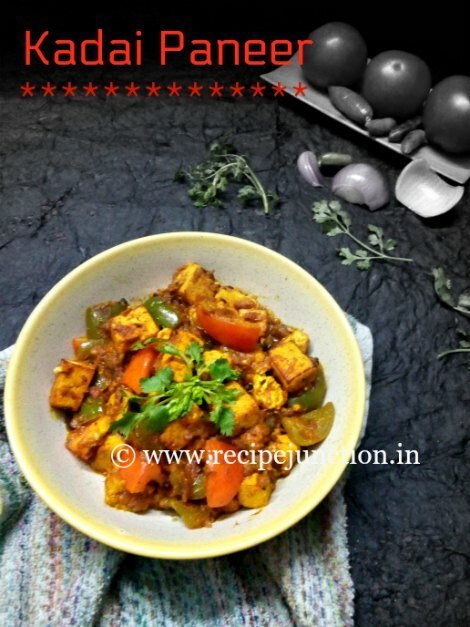 Kadhai paneer, one of the popular dish of paneer from the state of Punjab, India, where Paneer or Indian cottage cheese and bell peppers are the main ingredients, which is flavoured with kasuri methi(dried fenugreek leaves), ginger-garlic and a blend of light Indian spices makes it a mouth-watering dish. 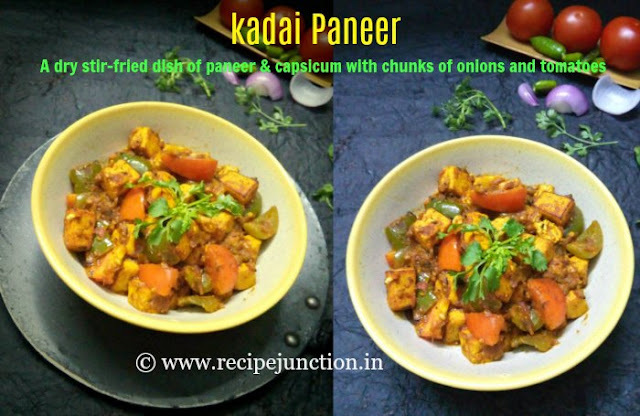 This dish gets its name Kadai or Kadhai paneer, since it is cooked in an Indian utensil named, Kadhai/Kadai which is just like Chinese Wok style utensil. it is cooked with very minimal spices, so the end result is so flavourful and it can be a perfect accompaniment to any kind of Indian bread or rice. This dry version is optimal for lunch-box menu and there is a gravy version too, which can be cooked for any party or special occassion. But I just love this dry version and often made at my home which goes well with rotis. Kasuri Methi : 1 tsp. Heat 2 tblsp. Oil in a pan, shallow fry the paneer cubes until light brown on both sides. Take out from the pan and drop them in a bowl of hot water for 10-15 minutes. This will keep them soft. In the same pan, heat rest of the oil, temper with cumin seeds, add sliced onions and a pinch of sugar and saute till onions turn translucent. Add bell peppers/capsicums, green chillies and ginger-garlic paste, saute again 2 more minutes in low flame. Then add powdered spices and pureed tomatoes. Mix well with onion-ginger-garlic paste. Fry till masalas are well-cooked. Add cubed tomato and onion slices and saute for 2-3 minutes. Add fried paneer cubes. Mix well everything. You can add little water(1/2 a cup). Add salt to taste. Cover the lid and simmer for 7-8 minutes until peppers are just cooked and paneer cubes softens. Note: it's a dry gravy dish. Lastly, before you take out, add dried kasuri methi, give a good stir and remove from fire. Serve garnishing with fresh coriander leaves. Enjoy with hot chapati, paratha or any Indian flat bread. Labels: North Indian recipes, Paneer, Punjabi cuisine, Side dish, Veg. 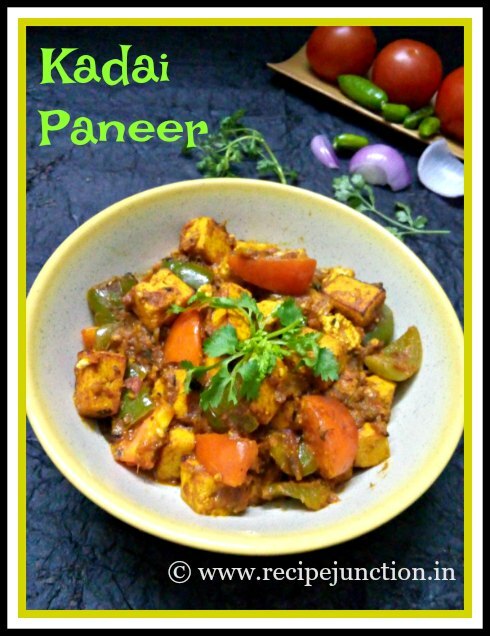 anything with paneer i am in:) kadai paneer sounds so yummy n inviting!! love it!! I do it the same way, looks delicious..
wow kadhai paneer looks absolutely delicious !!! Super tempting kadhai paneer, love it with some rotis. This is great blog.Loved the blog .Thanks for sharing.